Whether you’re hosting a holiday party, expecting family over for the holidays or simply want to free up some space in your house, decluttering is never a fun task. Although most of us procrastinate house decluttering for as long as possible, it is possible to refresh your house in a fairly pain-free manner. To help you get your house in tip-top shape for the holidays we’ve created a simple and easy to follow a plan for a clean, clutter-free house. 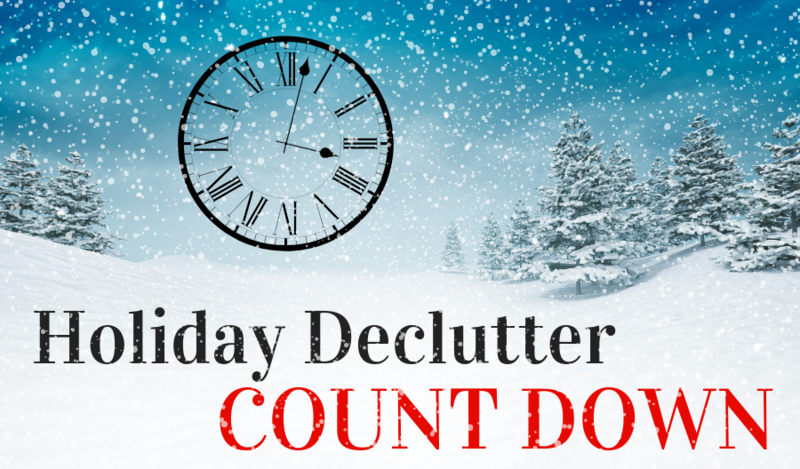 Create a decluttering calendar that breaks down your house into more manageable sections, instead of being overwhelmed with the idea of every room in your house. By choosing to tackle your house one section at a time you’re more likely to stick to it and eventually your entire house will be clutter-free! Use your bullet journal or notebook to create an easy-to-follow decluttering calendar. Remember you don’t need to tackle your whole house all at once; by spacing out each section of the house into something manageable, you’re more likely to stick with it. For example, kitchen cabinets and the fridge on Monday and hallway closets on Wednesday. When decluttering, make sure to remove everything from that shelf, closet, or whatever section of the house you’re decluttering. This might seem like a lot of extra work versus simply looking through the space to see what needs to be thrown out, but this is the best method to ensure that nothing is missed. We’ve all been there; you come across an item that you haven’t seen or thought about in months and you start to justify why you need to keep that item. (The Purple Dress that you have saved for someone’s future wedding) The rule of thumb for decluttering is if you haven’t seen it or worn it in 6 months, it’s probably time to part with it. For those of us who are notorious clothing hoarders that are finding it hard to part with items that you probably won’t wear again, you can give yourself a little more time to decide if those items are worth keeping. Simply change the direction of the hanger once you wear something as a signal that you’ve worn that item. If after a few weeks there are many items with unturned hangers, it’s time to add them to the donation pile. Sometimes necessary items will take the form of clutter due to poor organization. Storage bins can add a neat look to a messy, crowded space. If you’re really feeling crafty, add custom labels to each storage bin to make finding what you’re looking for quick and easy. One man’s trash really can be another man’s treasure. If some of the items you’re getting rid of are in good condition and worth a reuse, consider donating them to the Salvation Army, Goodwill or your local thrift shop. Another added benefit of donating your unused items is that your donations can be used as a deduction on your tax return.